There are a few places that I could go every year for vacation and be perfectly content. Indians Spring Training in Goodyear, Arizona is one of those places. The sky is bright blue, the sun is shining and there is barely a wispy cloud floating by. The atmosphere is perfect for any baseball fan. All of the teams play within 30 minutes or so of one another, so it is easy to follow your favorite team from park to park. Each park tries to take on some of the characteristics of the home team. At Goodyear, home of the Indians, you will find stadium mustard. Camelback, home of the White Sox has all the fixins for Chicago dogs. For me though, the best part is the easy vibe that wafts over the stands. The ushers are OK if you wander around to take pictures. Players sign autographs. Fans chit chat with one another. It is incredibly relaxing. While I love seeing the games, the best part for me is watching practice.The guys are laid back and you have up close access to them. Choo and Kipnis having a laugh. The players are chatty, some of them and you can joke around with them. Choo was especially funny when fans gave him a little grief about his bats. He has a special bag for each bat, and then he puts each bagged bat into his bag. There is a short chain link fence at the practice facility that fans hang on, hoping their favorite player will stop by to sign something. In the interest of full disclosure, I am an autograph hound. Somehow I missed that phase as a kid, so I am making up for it now. The folks hanging out for autographs are mostly fans and dealers. I was getting signatures for my own personal excitement, while a few guys were doing it for eBay. I know it has to be weird. These guys are at "work" and people are constantly breaking their concentration by pleading for a chicken scratch across a ball. Most of the players were awesome. Some, well, some are rumored to be jerks. Stories on the fence circulated about who was tough to get (Mr. Always Owie Sizemore for one) and who was amazing (Manny Acta). There were some awful stories, one in particular about a player I won't name. A kid (the kid told the story) asked him for an autograph. He said later. The player came by again, and the kid asked again. The player said no. The player walked by again and the kid asked again. The player walked straight up to the kid and barked, "I told you NO! I mean NO!" Yikes. But, in all fairness, there are days at work I am cranky and am doing everything I can not to scratch out the eyes of my co-workers. I can only imagine the carnage if people were yelling at me and God forbid harassing me while I was trying to go to the bathroom. So, I get it. As Mr. Asdrubal Cabrera told me, he was working. Eeek. 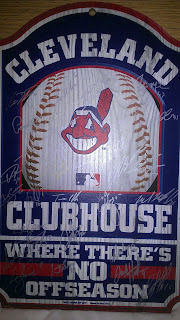 Fortunately for me though, I was able to meet all the players that I wanted and they all signed my sign. I originally had a gold sharpie paint pen but that ended up being a big fat fail, so I fell back on my pocket full of silver sharpies. I think it turned out awesome. On a side note, if you are trying to get baseballs autographed, I have a few hints. First, if it is a new ball, rub it down with alcohol and let it dry. Then, use a basic trusty ol blue ball point pen for the autographs. Sharpies will fade after time on the ball, but the blue ball point will last decades. Sharpies work best on photos and bats. In case you were wondering. Since I returned from Spring Training, every one asks me what the team looks like and my predictions. I will tell you the same thing I say every year. This my friends, is the year.